3rd Annual Rocket City Technical Communication Conference! 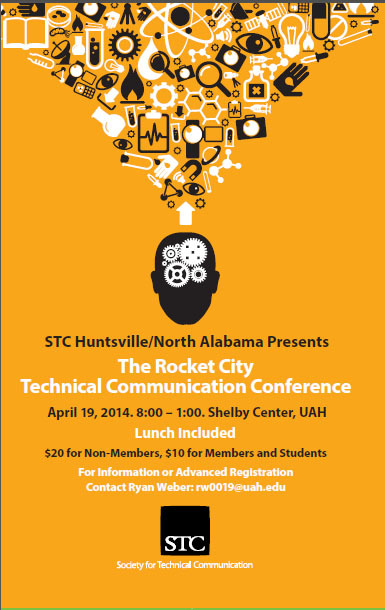 The STC Huntsville/NA is proud to announce the 3rd annual Rocket City Technical Communication Conference. The event will be held April 19, 2014 from 8:00-1:00 in the Shelby Center on the UAH campus. Panels will cover topics like starting a tech writing freelance business, using social media, working with SMEs, writing in multimedia, and more! Registration is $20 for non-members and $10 for members and students. Lunch is included! Join us for this great learning and networking event!